NEC® rules have changed for everything from electric signs to IT equipment to PV systems. Learn how revisions in the 2017 edition of the National Electrical Code® impact your installations. 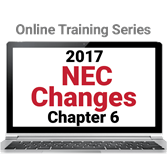 NFPA 70®: Changes to the NEC 2017 Edition - Chapter 6 Online Training helps ensure you're aware of the latest requirements for rapidly changing technologies as well as important safety updates in the 2017 NEC. Chapter 6: Special Equipment addresses everything from electric signs and outline lighting, to IT equipment and fire pumps. Chapter 6 also covers renewable energy equipment, including solar photovoltaic (PV) systems, fuel cell systems, and wind electric systems. This new interactive online training from the Code source helps you improve your ability to locate, interpret, and apply today's rules -- so you save time and reduce the risk for oversights and errors. Working at your own pace, you'll get an inside look at significant revisions impacting many types of special equipment. Four online modules guide you through major changes in 23 articles in NEC Chapter 6, with a full module dedicated to changes that impact PV systems. Understanding these Code changes will help improve your ability to advise clients, design and install systems, and keep projects and facilities in compliance. Go online now and take the latest modules in this dynamic series!